Charline von Heyl, The Language of the Underworld, 2017. © 2018 CHARLINE VON HEYL. COURTESY OF THE ARTIST AND PETZEL, NEW YORK. Linking the experience of engaging with von Heyl’s paintings to listening to this piece of music, Corbett added, “Charline’s paintings take time, too, but because they are paintings, people sometimes do walk past them, remark on their beauty, and move along.” But . . . and this is a huge caveat . . . von Heyl’s paintings defy conventional notions of beauty, the same way they flout traditional categorization. They are not, in her words, abstract paintings, nor are they figurative. Instead, they are “non-representational” paintings, which occupy an in-between space. To see von Heyl’s paintings always requires openness and total surrender. You have to look, move on, return and look again. This is a cycle of seeing the work on your own terms. 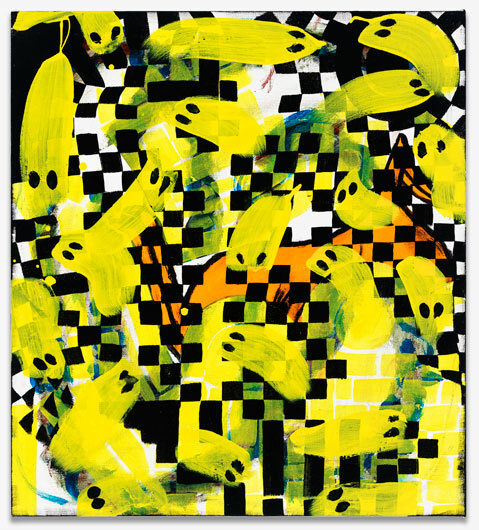 Charline von Heyl, Spoudaiogeloion, 2015. One of today’s most inventive painters, New York-based German artist Charline von Heyl (born in 1960) has received international acclaim for her cerebral, yet deeply visceral artworks that upend conventional assumptions about composition, beauty, narrative, design, and artistic subjectivity. Combining keen humor, a rigorous, process-based practice, and references to a broad array of sources including literature, pop culture, metaphysics and personal histories, von Heyl creates paintings that are neither figurative nor abstract, but instead present in her words "a new image that stands for itself as fact." 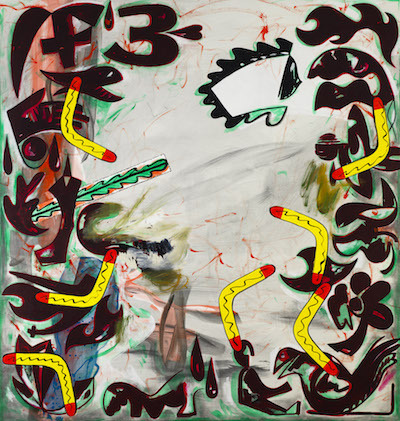 The dice thrown may show two ones: Snake Eyes, the title of the exhibition by Charline von Heyl. Yet the title also conjures up the rhythmic, meandering movement of a snake – a complex structure between abstract and evolved structures and a body silhouette revealing the intriguing use of associations in her work. Each of her pieces seems to be a complex creation between art history and contemporary visual worlds, timeless and yet in every detail an outcome of the present. A feeling of objectivity permeates von Heyl’s work as a kind of subversive text, creating a state of distance in all its lyrical and soulful condition. In this respect, the title of the exhibition indirectly refers to the artist’s eye as a highly specialized tool for observation, steadfast and unyielding, yet also playing with autonomous painting in poetic-satirical self-reflection. Von Heyl’s intriguing images unfold in an intricate, unpredictable interaction of layers. 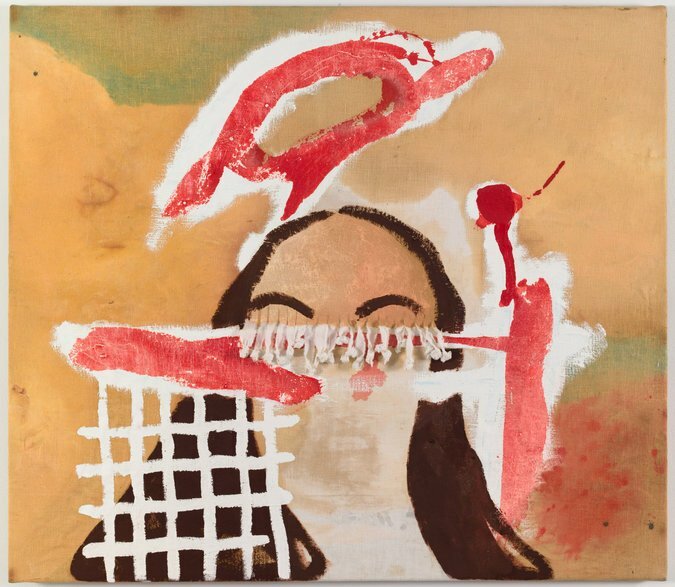 Highly influential within today’s painting discourse, her works are to be found in some of the most relevant international collections such as the Tate Modern in London, the Museum of Modern Art in New York, the Museum of Contemporary Art in Chicago, and Musée d’Art Moderne de la Ville de Paris. A survey of paintings by Charline von Heyl will be mounted in Germany in June at the Deichtorhallen Hamburg and then, for what is being billed as the largest American museum survey yet of the German-born, U.S.-based artist, will travel in the fall to the Hirshhorn Museum and Sculpture Garden in Washington, D.C.
After the German incarnation of the show—to run June 22 through September 24—approximately half of the works will head Stateside while the others will go on to show at the Dhondt-Dhaenens museum in Ghent, Belgium. The Hirshhorn exhibition, to open November 1 and continue into February 2019, will focus on the U.S.-based loans from the German exhibition, including some 30 paintings made since 2005. Charline von Heyl creates paintings that function as self-perpetuating visual events, enigmatic pre- sences silently seducing or disturbing the viewer. They are often funny, but not afraid of poetic depth and even pathos. The colors are active: they shift, empty out or recharge depending on the time of day and the position of the viewer. Interference colors made to engage paradoxically with light con- fuse the hierarchy of tonality. Copper, aluminum-flakes, dirty pastels, charcoal powder, fluorescents but also graphic black and white are laid down in unstable and abused layers to provoking different moods and feelings. A 1995 Charline von Heyl at Petzel. CHARLINE VON HEYL: Why Not? Join us for a series of one-on-one conversations between curators and painters in front of their paintings on view in the exhibition The Forever Now: Contemporary Painting in an Atemporal World. All conversations take place in The International Council of The Museum of Modern Art Exhibition Gallery, sixth floor, unless otherwise noted. Seating is extremely limited. In conjunction with the exhibition The Forever Now: Contemporary Painting in an Atemporal World.